With the Mustangs trailing by a run in the eighth inning, Alex Phillips stepped to the plate and delivered. The first baseman sliced a double down the left field line. Mustang fans erupted as Joshua Lincoln and Zachary Smith crossed home plate. St. Joe toppled the Clarinda A’s 10-8 in an offensive battle on Friday night. 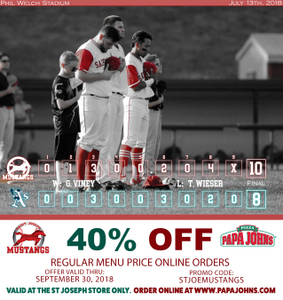 The win brings the Mustangs record to 20-19 and places them one game up on the A’s for second place in the MINK league north division. Mustang fans enjoyed Friday Night Lites with one dollar Miller Lite, Coors Lite, Bud Light, Busch Light; $2 drafts. Dust clouded the cleats of Jason Maxson as he rounded second base and eyed third. He had just launched the ball to deep center field to leadoff the second inning. The catcher arrived safely at third and raced home on a wild pitch to give the Mustangs an early 1-0 lead. Maxson returned to the plate in third and continued to tee off at the plate. He crushed a bases clearing double to straightaway centerfield scoring two runs and handing St. Joe the 4-3 lead. The Mustangs celebrated Test Your Luck Night. The first 150 fans ages 18 and over received a free Scratchers ticket, courtesy of the Missouri Lottery. With runners on first and second in the sixth inning Mason Janvrin dropped a single into left field. The hit scored Aaron Dees bringing the St. Joe to within one. Later in the inning, Phillips stepped to the plate with the bases loaded. Using his keen batter's eye the first baseman earned a walk and tied the game at six. Fans scored with Hy-Vee Fuel Saver Fridays. Bring your winning ticket stub from the game to St. Joseph Hy-Vee within seven days and receive a 20¢ Fuelsaver! Jordan Maxson went 3-5 with a triple, a double, an RBI, and a run scored. Mason Janvrin went 2-3 with three runs scored. Alex Phillips went 2-4 with three RBI and a run scored. The Mustangs lead the MINK league with 81 doubles this season. St. Joe has 19 more than the Jefferson City Renegades who are in second place. St. Joe scored double-digit runs for the sixth time this season. Be one of the first 250 fans to the ballpark and receive a Phil Welch Stadium Replica, courtesy of Cody Vaughn and Thrivent Financial. It’s also Fortnite Night! Guests will have the chance to enter to win a Battle Pass. There will be a treasure chest hunt, a dance/emote contest, plus photo opportunity to wear a Fortnite Costume on the Island.